Melanie Dostis, 20, has been working as a journalist for nine years. That’s correct. When she was only 11, Dostis created her own monthly newspaper, “The Apple,” which was stylishly printed on pink paper. She and her best friend distributed the paper in their elementary school in Queens, N.Y.
Dostis remembers printing articles about things that caught her attention. She would watch television news and find something interesting — “whatever was going on around the world that I felt everyone in the school should know about,” she said. She also reproduced fashion tips, crossword puzzles. “We would include just a page with song lyrics that were hot at the moment,” she added. It wasn’t long before a teacher approached Dostis and encouraged her to turn her little publication into the school’s newspaper. “The Apple” went from being a fifth-grader’s hobby to becoming the official paper of St. Mary’s Nativity. She began college seeking a more profitable career in medicine. After trying an internship at a hospital, Dostis realized that journalism was her true goal regardless of the income. 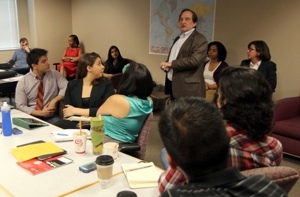 Dostis, born in Queens, is now a student at Northeastern University in Boston, who expects to graduate in May 2014 with a bachelor’s degree in journalism and international affairs. 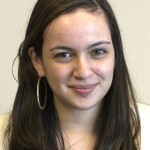 Before becoming part of the Institute, Dostis interned for Manhattan Media as an editorial intern during the summer of 2011, as lab monitor for the New England Newspaper and Press Association during the fall of 2011, and as metro intern for The Boston Globe, where she is now a part-time metro correspondent. She is now determined to become a foreign correspondent for The New York Times covering the Middle East. That’s a tough goal, but remember, she’s been on the job since she was 11 years old. Contact Danya Pérez-Hernández about this story.